Mexico’s Cabo San Lucas, located at the very southern tip of the Baja Peninsula, enjoys the well-deserved title of Marlin Capital of the World. 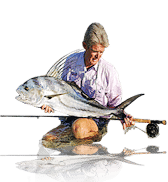 The Sea of Cortez and the Pacific Ocean, two magnificent bodies of water, collide right in front of Cabo, producing some of the most productive fishing grounds found anywhere on the planet. From Cabo, local crews and visiting boats spend a good bit of their time targeting billfish, including swordfish, sailfish and striped, black, and blue marlin all year long — sometimes within sight of the shoreline. Cabo crews catch some big marlin here every year, ncluding more than its fair share of fish weighing 1,000 pounds or more and the list of world-record catches taken here is too long to list. 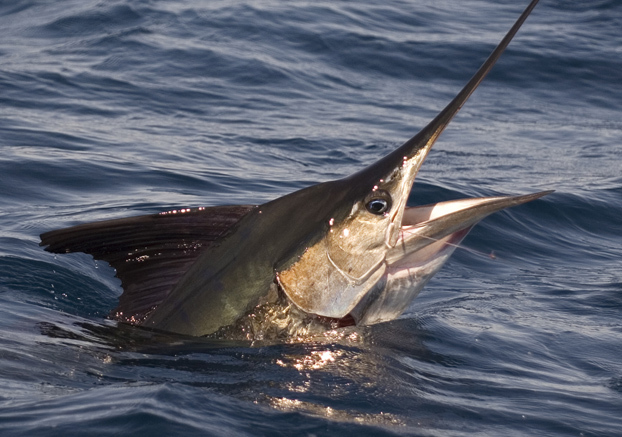 Striped marlin are caught all year but the fishing is best from February through June, and when the massive schools of bait show up, the fishing goes insane. Several boats have caught and released 100 or more striped marlin in a single day! Blue and black marlin fishing usually peaks from July through the end of November, but again, you can find a big marlin on any day of the year here. Most of the big money tournaments such as the Bisbee take place in October. Although billfish have made the area famous, anglers can target an assortment of species here including dorado, tuna, and wahoo offshore as well as roosterfish, pargo, cabrilla, sierra mackerel, grouper, yellowtail and jacks just outside the surf line. Boaters can tie up at Cabo’s huge marina featuring 380 slips with room for vessels up to 200 feet. The marina is strategically located downtown, just minutes from the deep underwater canyons that lie just beyond Lands End. 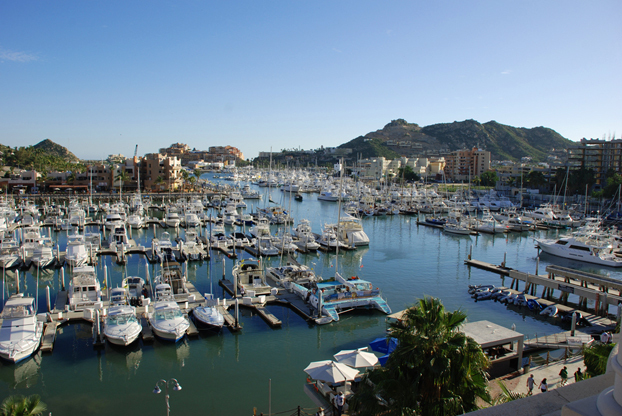 Marina Cabo San Lucas is clearly one of the globe’s foremost sport fishing destinations. Puerto Paraiso Mall, an upscale, three-level structure, anchors one corner of the marina. With 10 movie theaters, a bowling alley, arcade and parking for visitors and locals, the shops offer an impressive array of international items and something to do on the odd weather day. The entire marina is surrounded by hotels, restaurants, nightclubs and tequila bars. 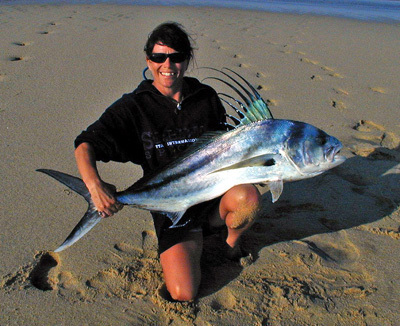 Cabo is home to an enormous fleet of independent sport-fishers and pangas for hire. The area books an incredible 50,000-plus charters each year. The pangas and center consoles provide inexpensive access to Baja’s prolific fishery. They can accommodate up to three anglers and offer full- or half-day trips with morning or afternoon departures. Sportfishing vessels from 40 to 80 feet with room for six to 12 anglers are also available. Trailer boaters are welcome and fishing from your own boat in some of the most fertile waters in the Western Hemisphere can be an exhilarating experience. Boaters can use the well-maintained, easy-access launch ramp in the harbor and if you decide to leave your rig for another trip, there are several companies that offer dry storage. If boats are not your thing, how about some do-it-yourself fishing? Cabo San Lucas has miles of beaches, ideal for spin and fly-fishers alike. Roosters, jacks, and sierra are well within casting range. Pack some surface lures or spoons, (or for the fly-guy, Deceivers or Clousers), and toss them out into the bait schools which are driven into the shallows by feeding fish. It’s always an exciting way to spend the day. 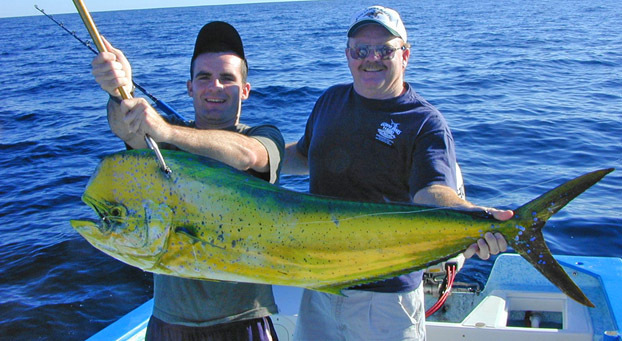 For the more competitive angler, Cabo offers more fishing tournaments than anywhere else in Baja. These tournaments attract anglers from the four corners of the world to compete in events covering the entire spectrum … from small affairs with a few anglers to Bisbee’s Black and Blue Tournament, the richest tournament anywhere with millions in prize money. Despite the recent economic setbacks, Cabo San Lucas, Baja’s crown jewel, is still a unique destination for both first-time visitors and knowledgeable Baja veterans. Constantly changing, it offers a buffet table of memorable experiences to pick and choose from. Visitors can find a range of activities for every taste — from adrenalin-pumping excitement to a tranquil walk on a deserted beach, golfing to skydiving. And there is no lack of great spots to rest your head. Choose from economical accommodations to five-star, beachfront suites. With its sunny days and mild year-round weather year-round, this small village has grown up to be one of the most popular destinations in the Western Hemisphere, if not the world.